A surprise guest star is the real star of this Sherlock Holmes pastiche. Nicholas Meyer’s Sherlock Holmes pastiche The Seven-Per-Cent Solution might feel like a corrective to recent revisionist versions of the character, but it was actually just ahead of its time. Written in 1974, the book pre-dates Benedict Cumberbatch’s lizard-man intensity and Robert Downey Jr.’s action-movie cad. Adapted here by Terry McCabe, it details Holmes’s recovery from cocaine addiction at the hands of a certain young “Austrian specialist.” However McCabe’s adaptation, directed by Warner Crocker, treads lightly on the subject of drug addiction. There is, after all, a mystery to be solved. Narrated, of course, by Dr. Watson (Adam Bitterman), the play follows Sherlock (James Sparling) as his cocaine-addled ravings lead him to declare his former math tutor, professor James Moriarty (Elliott Fredland), to be the “Napoleon of crime.” Watson fears for his friend’s life, and so tricks Holmes into traveling to Vienna to undergo a radical course of treatment administered by the Austrian specialist (Lee Wichman). Once Holmes is recovered, the three men are promptly drawn into a mystery concerning a catatonic woman, an anti-Semitic young baron and Europe’s ever-quickening arms race. 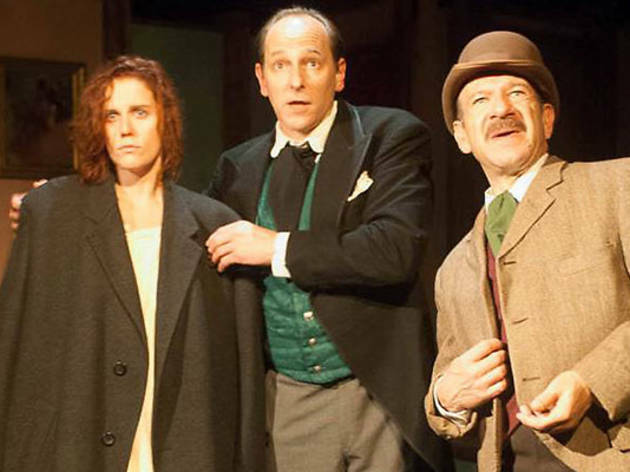 Although Holmes is the draw, it’s Wichman’s Austrian Specialist that’s the show’s real star. 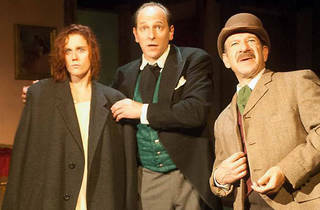 His dry, understated wit is most welcome, as Sparling struggles with exactly how to portray a coked-up Sherlock and Bitterman’s booming narration drags through most of Act I. It isn’t until the game is afoot in Act II that the show finds itself. After a queasy first half, it’s an old-fashioned Sherlock Holmes mystery that proves the real solution. City Lit Theatre. Written by Nicholas Meyer. Adapted by Terry McCabe. Directed by Warner Crocker. With ensemble cast. Running time: 2hrs 10min; one intermission.